It is the longest day of the year. And for some it has been a very very long day. Outside my office window, icy storm-force gales are slowly abating as the worst storm to hit the Wellington region since the 1968 storm that sunk the Wahine moves away. My riding circuit – the south coast – has been smashed by 15m waves. Roofs have been dislodged, and trees ripped out of the ground all over. Ugly. My house got away with only damage to a gate (I think – have to check closely when I get home). Phew. So now I’m having a wine. Is it safe to Drink and Work? 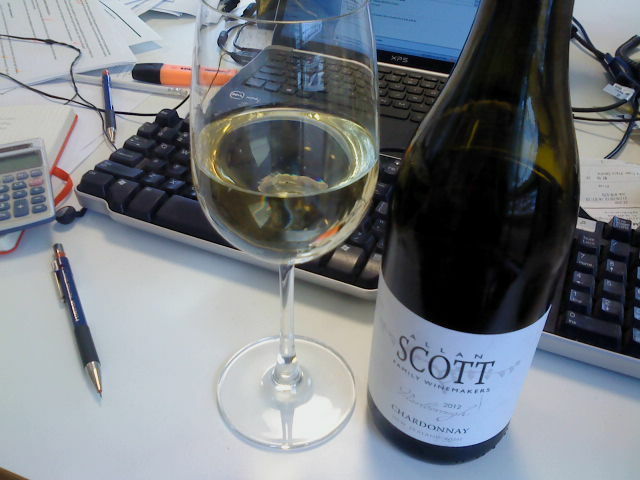 This entry was tagged 2012, Allan Scott, Chardonnay, longest day of the year, Marlborough. Bookmark the permalink.